To understand the changes on the way, think back to the changes society and companies underwent in the industrial revolution: moving from a decentralized, agricultural and artisanal organization to a centralized, mechanized industrial organization of work. Digital workspaces and the new information age has swung the pendulum back to decentralized, local-based management models where the decision-making is less about control & command, and more about trust & collaborate. Looking at the drivers of the new ways of working, we see traditional needs of greater productivity at lower costs, and we see some new ones involving technology-enabled lifestyle choices. Greater productivity and lower costs are always concerns for all organizations, public and private. Everyone wants their company or institution to be more efficient and produce better results relative to its costs and complexity of operations. The new digital workspace is not a trend or a sound-bite, but rather a profound change in the way we work together, communicate, make decisions, and distribute responsibility and accountability. The future of work, its organization, its activities and the inter-relations of people within the organization are being driven by forces beyond the control of individual decisions, i.e. this is less about ‘do I want to make changes or can I wait’ than it is about ‘what changes do I need to make right now to stay relevant and profitable’. Real estate expense has been a consistent source of concern for large private and state-owned companies for decades. The large, often luxurious office buildings, company-owned production and warehouse facilities which have been the staple of major corporations over the past century are now often considered high-cost, profit-reducing, and inefficient assets. Facilities infrastructure are often based on old models. Things such as internal data centers and large IT departments are disappearing. Communications costs and interoperability of systems/devices are becoming easier as firms move their data management to the cloud (information as a service at a vastly reduced cost). The intranet is a very important delivery channel within the wider digital workplace, as well as some wonderfully creative office space and meeting rooms. Smart buildings and new applications are allowing for economies of usage and ease of communications. Efficiency costs linking a modern infrastructure with core processes, promoting unified communications across a common platform, using the new social media and self-service HR tools are allowing many market-leading firms in all sectors to improve the way they manage client and employee services. From fixed systems of production to open ended flexible systems with a high level of trust and highly skilled, autonomous workers are at the core of gains in corporate efficiency. Lost productivity from absenteeism, stress and de-motivation are costing hundreds of millions of dollars and euros to companies who have not yet been able to mine human capital potential to achieve optimal levels of productivity. Productivity applications are providing opportunities to work better and smarter. Remote working and flexible hours have helped to eliminate unproductive time in travel and low value administrative tasks, like showing up at the office every day for the sake of ‘being present’. Management credibility requires new competency models as a new generation of professionals enter the workforce. Is management moving the organization forward in the new ways of working, are activity based working models being implemented? The quality of the corporate communications within the digital workspaces, the collaborative frameworks, the flexibility and motivation of the workforce are differentiators in today’s markets based more on alignment than compliance. Learning and innovation capabilities are even more mission critical than in the past. The learning organization is dependent on the ability to capture, store, distribute information in real-time. Technology plays a key role but adoption remains slow and clumsy. Being able to communicate via all channels seamlessly, to design and produce work products in a highly connected, secure environment is now common-place. The best service provider solutions are combining professional HR consulting firms with technical consulting expertise to create these new digital workspaces. Human kind’s ability to double its database of collective knowledge took many thousands of years prior to the steam age, a couple of hundred years to double it since then, two years to double it from today’s date and before the end of the decade it is estimated that the doubling of the collective knowledge of man will be achieved in less than 72 hours. This is Moore’s Law on steroids. How are things changing for the digital workers in the information age? 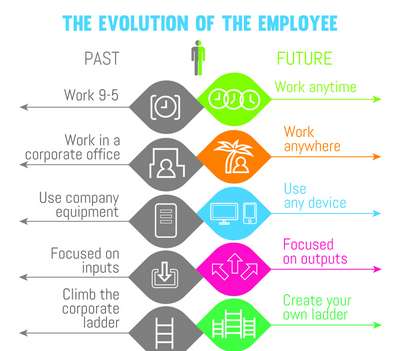 From the employee point of view, things are changing even faster. The future of work will be more flexible. The following diagram provides a high level overview of the evolution. The implications are even more meaningful when considering the way the youngest generation of workers are thirsty for new ways of working within digital workspaces, from Generation X (Baby Boomers) to Generation Y (Millennials) to Generation Z (so-called ‘Gen Tech’). The best companies and organizations are implementing digital workspaces in order to create competitive advantage, to recruit and retain the best talent as well as preparing the future of the institution itself for a better, more productive, lower cost work environments. Human Capital remains the greatest area of value creation for companies large and small, private and public. Business and technology ecosystems are combining business solutions to implement digital workspaces so that individuals and organizations can be more productive, and more balanced in their approach to work and life. The future of work will require new configurations at an accelerated pace.